PC Financial MasterCard is typically available to those with good credit scores (650 or greater). A solid addition to your wallet if you use a credit card for everyday purchases and shop at Loblaws, Shoppers Drug Mart and Joe Fresh stores on a regular basis. It’s especially great for families with kids who are looking to make the most out of their weekly grocery runs. 20 points per litre of gasoline or diesel purchased at Esso stations in Canada. The PC Financial Mastercard is the most basic PC card, however, that doesn’t mean that it isn’t a great option. The PC Financial Mastercard does not have an annual fee and there is a low income threshold needed to apply. This makes it a great credit card option for students or young people just entering the workforce. 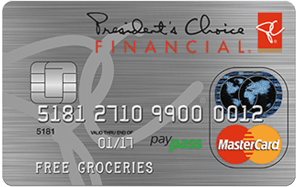 The PC Financial MasterCard is usually viewed as an entry level rewards card for those who shop at Loblaw-owned stores, but it’s also one of the best balance transfer credit cards in Canada. New account holders get an interest rate of just 0.97% for the first six months. There’s no fee to make a balance transfer which is also very appealing.